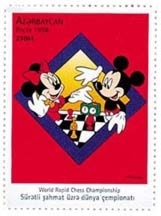 Above left: Stamp to raise money for charity, not a governmental stamp. 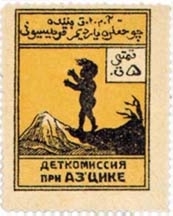 Azeri in the Arabic and Cyrillic scripts. Early 1920s. Courtesy: Yagub Karimov. Above right: Commemoration of chess, a favorite pastime in Azerbaijan. 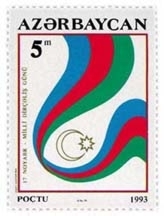 Vivid illustration of the use of English with Azeri Latin on a stamp. 1998. Bottom left: Commemorating the independence of Azerbaijan. Azeri Latin script adopted in 1991. Note the use of umlaut (dotted) "a" which reverted to the "upside-down e" in late 1992 just as it had been written in Azeri Cyrillic during Soviet times. 1992. The monetary unit "q" means kopek, a currency which no longer exists in Azerbaijan. 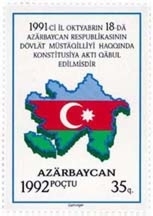 Bottom right: Another celebration of Azerbaijan's statehood. Note that the "upside-down e" is in place, the umlaut "a" is gone. 1993.